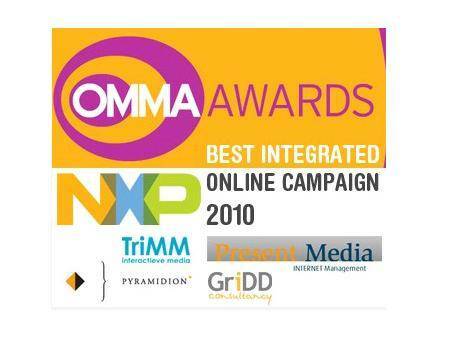 … of the MediaPost OMMA New York Members’ Choice award for Integrated Online Campaign goes to NXP Semiconductors with ‘Join the Lighting Revolution’ (supported by amongst others Pyramidion, Present Media, TriMM and GriDD)”. Yes folks it is that time of the year. Time to brush down the tuxedo and break out the bling – industry award season is upon us. OK so while they don’t quite match with the razzmatazz of the Oscars, the BAFTAs or the Razzie’s, marketing industry awards do put a little added shine onto those late nights. So for all of us involved in NXP Semiconductors’ campaign ‘Join the Lighting Revolution’, it was great to hear that the effort which went into it was recognized with two separate nominations. The first was for the MediaPost OMMA New York awards in the category Integrated Online Campaign. This award is for online marketing campaigns of multiple elements that show outstanding usage of online media in promotion of brands, products and services. Unfortunately the team was beaten to the Business-to-Business sub-category award from a shortlist of three (Summer for Bravo Digital Promotion by NBC Universal and Business on Main for Sprint by Mindshare). However disappointment was quickly dispelled as NXP won the Members’ Choice award for Integrated Online Campaign. The campaign is also nominated for the prestigious B2B Marketing Awards in London in the Best Lead Generation Campaign category. Battling against five other campaigns and up against stiff competition, the B2B Marketing Awards are due to be announced at the end of November. So fingers crossed for more success!